Green Fees: £40 per person in high season, £30 in low sometimes including coffee, bacon roll and a meal if four ball or more is booked. Offers for TSG members on Society and other golf days. The course enjoys all the benefits of parkland golf, in the shape of old, seasoned turf which produces excellent fairways and smooth, true greens. It has been shrewdly landscaped and planted with trees. In recent years the course has been undergoing renovations with new bunkers and re-laid greens have helped to maintain this historic course. Not overly long the course is Par 69, off the yellows and is just over 5,800 yards in length. The wide variety and beauty of these, often ancient trees is very much a feature of the course. The holes are sound and of a good length, the course has been very much improved since it was remodelled by James Braid, five-time Open Champion. 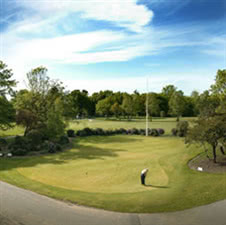 The most memorable characteristic of the current Blackheath Golf club course is the strength of its start and finish. The club believes that the first four holes are as challenging a start to a round of golf as can be found anywhere, including the courses on the Open Championship rota. Golfers and Visitors of all levels are always welcome. 2 holes with temp tees and greens, so obviously, not as enjoyable as it would undoubtedly have been had the work been completed. Re the repairs, the work is being carried out to an excellent level. The course was tranquil on a Monday afternoon, so with good company, it was a pleasant stroll around a seriously well designed course. I played off of the yellow tees, and good shots from the tee and fairway were rewarded, but bad shots will most definitely be punished, so great risk/reward shots available. I didn't use the practice facilities, or the clubhouse, (as i did not bring the correct attire, my fault of course), but i cannot comment on what i haven't seen. But the staff in the pro shop were extremely pleasant and helpful, and I am sure the clubhouse will be as well designed as the course that it looks over so impressively. As other reviews have mentioned, the clubhouse is very nice, and had that oldie worldy members club feel about it. The course was generally in good condition, though a fair amount of GUR around, no doubt following the programme of works being done there. Greens were very good, with quite a few subtle breaks, so not easy. Some of the bunkers could do with a bit more sand, but overall an enjoyable days golf on a decent course. Not too much danger to contend with, but tough playing off the white tees though in fairly windy conditions at times, so only one of our mini society managed to play to their handicap. Definitely play again if the opportunity arises. First time I have played the course. Not too hilly beautiful setting. Suited my game, and helped by the weather had a great day. There was quite a bit of work going on with course improvements but this didn't spoil the enjoyment of the game. Greens were in great condition. Another one of London's gems - hidden away but easily accessible. A private members club with all of those good traditions accumulated over the years. Obvious signs of course redevelopment - didn't detract from a pleasant experience. It is worth playing with a member as some of the targets are not that obvious but our guide was very good and we didn't aim for the wrong flags. Some good elevation changes - and the blustery wind - made club selection paramount and playing a more conservative game to keep away from trouble did pay dividends. Considering the amount of rainfall, Royal Blackheath appeared to be fairly dry and well kept. There's a nice differentiation between fairways and rough and greens (although members did mention that they thought them soft) were true enough and without to many snakes. Clubhouse hospitality is to be enjoyed (although midweek on the day we played the kitchen wasn't open prior to tee-off). Locals were an amiable bunch and there was a relaxed atmosphere all over. Building works detracted from a panoramic vista but pleasant enough for a parkland course in the middle of town. It would be nice to come back once the site works have been progressed. I might even find the ball lost somewhere in the back 9. I was an appreciative guest of RBGC member and fellow TSGer Judy Lilley for my debut appearance at the course in late December 2013. The course is beautifully laid out; with plenty of fairway bunkers to challenge ones driving and most holes have at least two greenside bunkers to avoid. On the day the greens were very receptive and true. The wet and windy weather conditions encountered on the day greatly impacted our round; with soft fairways and greens; the course played longer than the yardages on the card. Low scoring proved difficult if your drives were not on the fairways. It was also unfruitful to attempt 'hail Mary' recovery shots from the rough when you find yourself in trouble off the tee; which I did on a few occasions. The par 3 16th green proved problematic for me; do not miss the target on the right as the greenside bank shoots your ball into ditch trouble, hence a triple bogey! Playing from the yellow tees most of the par 4s are under 400 yards so there is a goodish chance for the shorter hitters to reach the greens in regulation enhancing opportunities for birdies or pars. The short par 4 18th hole will probably be an irrestible risk/reward challenge to the big hitting TSGers (you know who you are); I might even be tempted myself with a prevailing wind in firm conditions; then perhaps not! I am looking forward to playing this course again in April.